Curb Exchange is a self-guided audio- and print walking tour of the Wall Street financial district in New York City. Through a series of short walks and an accompanying print newspaper, the tour uncovers forgotten or lost stories from Wall Street’s past that may provide some clues to what happened in the 2008 financial meltdown. The tour featured an innovative mix of media, featuring 8 audio tracks and the Curb Exchange print newspaper, an 8-page publication especially designed for the tour. Each track corresponded to a mini-tour in which the voice of Bob, the fictional narrator and local newsstand owner, lead participants through a different era of American history: the Post-Revolutionary War Era (1790s), the Gilded Age (1860s-1890), the Progressive Era (1890-1920), the Twenties (1920s), the Great Depression (1929-1940s) and the Reagan Era (1980s-2008). During each walk, participants are led to former and current landmarks in the neighborhood to hear biting commentary and dramatic reenactments of the stories that occurred at those sites during that time period. 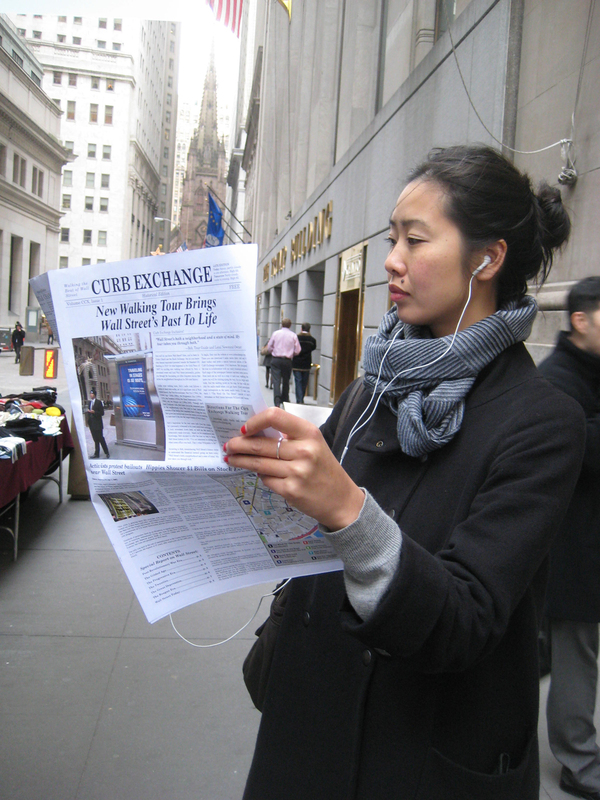 In addition, participants can browse through the Curb Exchange newspaper, featuring archival photographs and excerpted news articles, to read about the same stories they are listening to. Curb Exchange was inspired by the 2008 stock market crash, New York City history and experimental mobile narrative forms in a way to explore how storytelling and mobile technology can help create historical context for current events. Curb Exchanged was featured in Conflux Festival 2010 and hosted during Occupy Wall Street protests in November 2011. It is also available on the Locacious iPhone app.